Gaze back just seven years and you can see the high tide mark for the 'old guard' of smartphones in the shape of the Nokia N95. It was a complete multimedia computer with a list of functionality never before packed into a single, pocket-sized device. Released in March 2007 over 1 million handsets were sold in the UK alone by the end of the year – a lofty achievement when many still felt happy with a landline. As the N95 reached its first birthday, Nokia announced that more than 7 million handsets had been sold worldwide. It wasn't discontinued until the summer of 2010. Seeing how far Nokia has fallen it's tough to remember just how dominant the company once was. According to Gartner Nokia claimed 49.4% of all smartphone sales worldwide in 2007. The N95 represented the pinnacle of its achievements. For a few months it was universally recognised as the best smartphone on the market. Holding the Nokia N95 in your hand back then it felt like the future had arrived. Hardware specs age fast, but Nokia was really leading the field in terms of functionality and it took the competition a long time to match the N95 on paper. There was a 2.6-inch LCD with a resolution of 320 x 240 pixels, capable of displaying 16 million colours. It sported a 5-megapixel camera with Carl Zeiss optics, auto-focus, a decent flash, and controls to fiddle with ISO, white balance, contrast and more, not to mention the ability to record video at 640 x 480 pixels and 30 fps. It was one of the first phones to have built-in GPS, and its own mapping software, enabling it to replace a sat nav system. Sliding the screen up would reveal the dial pad, slide it the other way and you'd find a set of dedicated media controls for watching movies or listening to music. The speakers were impressively loud. It could play all of the common file types. The second edition boasted a bigger screen and 8GB of storage, to enable people to take full advantage and load up on media. The laundry list of features went on and on, including FM radio, a browser supporting Flash, a complete office suite, multi-tasking support for Java ME and Symbian apps, Wi-Fi, Bluetooth, a secondary camera for video calls, the ability to plug into your TV and output video, a microSD card slot, an infrared port, voice commands and support for HSDPA. This phone had something to satisfy everyone. 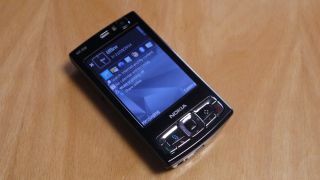 Our own Nokia N95 review summed it up as "the new benchmark for anyone attempting an all-round mobile phone". This was a phone that showed Nokia was the best manufacturer because it could tame technology better than anyone else around, and it had very little in the way of competition. RIM was in second place and its best effort was the BlackBerry Curve 8300, but it was still primarily a business brand. Motorola was still clinging to its iconic Razr design like it was a life raft. While the LG Prada certainly raised a few eyebrows, and Sony Ericsson was chucking out some decent feature phones, nothing came to close to the N95 in terms of functionality. But this was a train that was destined to derail, as Nokia was about to learn that simply improving the hardware and packing in more and more features would not be enough to maintain its success. It had built the most impressive house, but the Symbian foundations might as well have been quicksand. At the start of 2007 Steve Jobs unveiled the first iPhone at Macworld in San Francisco. By the time it went on sale, the N95 was already cleaning up in terms of sales. Spec for spec the difference between the two was laughable, with a poor camera and lack of 3G support leading many to decry the iPhone as a failure from Cupertino, but that big touchscreen and the iOS platform really captured the imagination. It didn't take long for Apple's smartphone to challenge in the sales charts. The iPhone proved something: interface and simplicity could actually trump awesome specs, something that the phone market simply wasn't based on. The N95 ran Symbian, and the S60 interface was befuddling – but back then, that was the norm. You just gritted your teeth through deep menu trees and four way buttons and hoped to learn how to use it. With a 332 MHz processor and 64MB of RAM it was incredibly slow and laggy. There were apps available and it was possible to update the firmware, but the process couldn't be described as user friendly. For all the fantastic features and functionality, the N95's interface was cumbersome and difficult to use compared to the new touchscreen devices. Even releasing an updated model with double the RAM left the N95 sluggish. By 2008 Apple had tweaked its formula and released the iPhone 3G. There was also a new platform in town in the shape of Android on the HTC Dream (also known as the T-Mobile G1). Nokia's answer was the N96, but the downward spiral had already begun. Next Page The everlasting phone?